The second sidecar race was a tight battle between Derek Lynch, Dylan and Mark Codd in a field of 8 bikes. Derek took the win but it was a drag race for 2nd that Mark Codd won ahead of Dylan. Race 3 saw Derek retire while battling with Dylan, who would go ahead for the win from Mark Codd\Liam Gordon and a podium for Darren Dwyer and C Gordon as the afternoon temperatures rose steadily. Race 2 in the twins was a tight one between the 2 classes leaving the Supertwin podium with some well earned Production twin riders on it too. Derek Wilson won race 2. Race 3 was re-started after a red flag, ran over 7 laps and Derek Wilson dominated this. Vinny Brennan won Production race 3 from Robert O’Connell in 2nd and Jamie Collins was 3rd. A smaller field of entrants than normal entered the Principal Insurance Pre-injection races. A red flag decided the result of Race 2 after 8 laps. As with the ruling the result went back to the leaders of the previous lap. Ian Prendergast won the battle from Ivan Oxley and Athy’s Colin Murphy claimed his second podium of the weekend with 3rd. Race 3 was shortened to 10 laps and Ian Prendergast got away first. He would eventually take the win from Kevin Madigan as Ivan Oxley grabbed 3rd place. Restarted Classic SBK race 2 was run over 8 laps after the red flag incident. Derek Wilson again prevailed on the ZXR750 from Chris Campbell and Robin Heathcote in 3rd. In Race 3, Campbell went one better by winning from Wilson with Heathcote again in 3rd. Race 2 Supersport Pro and Cup was definitely a combined race with two very separate battles going on. The gap between the two classes is big at the minute with almost one second between them per lap in some cases. Dean McMaster was in a different league this weekend with consistent 55’s. Race 3 had to be re-run after a red flag halted proceedings on lap 7. Again Dean McMaster took the initiative and couldn’t be caught. Cup rider Keelim Ryan upped the ante in the restart and was rewarded with a hard earned podium from Emmett O’Grady in 2nd. 3 wins from 3 for McMaster. Race 2 was a runaway win for Richie Ryan in SBK pro in blistering heat over 14 laps. 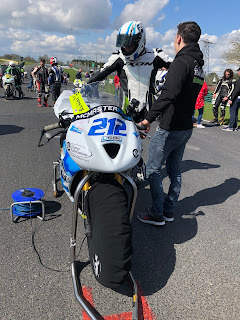 Back on form in 2nd was Peter Moloney and Luke Johnston also rode well in the heat to finish 3rd on the BMW S1000rr.The Cup race 2 win went to Jamie O’Keeffe, from Michael Prendergast and 3rd place Chris Campbell. Race 3, the Leinster 200 race was shortened to 12 laps due to time constraints. Peter Moloney got the better start from Richie Ryan, but Ryan passed him back on lap 3 and would go on for the win. James Kelly took a brilliant 3rd place. Chris Campbell topped the podium in the Cup race from Michael Prendergast, with Gary O’Brien taking third. Jamie Lyons unbeaten run in the Junior Cup continued this weekend taking the 3 wins. In Race 3 Michael Owen was 2nd and British Talent Cup invitee Oisin Maher was a close 3rd. In the Youngs Guns race 3, Alex Duncan won from 2nd place Karl Lynch and 3rd was Shane Mooney on the Aprilia 125. Race 2 Superbike B race was won by John Cahill from Alan Fisher. The Supersport B race 2 win went to Anthony O’Carroll. Results for Race 3 weren’t available due to a timing fault.